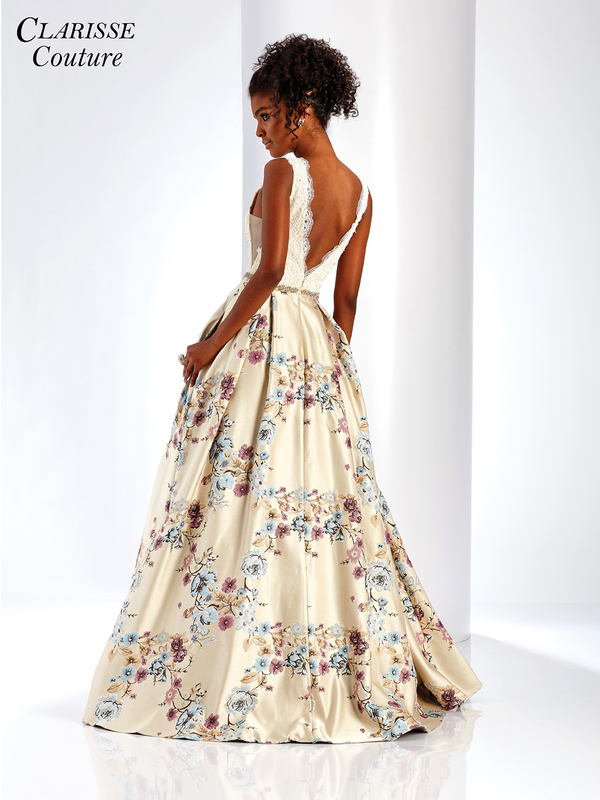 Looking for an evening gown that�s classic yet different? Clarisse Couture style 4973 is a sophisticated A-line dress that effortlessly mixes floral brocade and lace for a modern look in a timeless neutral color. The V-neck ivory and beige lace bodice is trimmed with scalloped details, and has sheer side panels for a flirty touch. A thin beaded belt connects to the pleated floral brocade skirt, covered in lines of pastel pink and blue flowers. This chic and feminine style would make an unforgettable prom dress or black tie evening gown. Center back zip closure, available in sizes 0 through 20 (Sizes 18 and up are an additional $25).